Company: Hays Czech Republic s.r.o. Hays, the world’s leading recruiting experts in qualified, professional and skilled people, announces today that it is expanding its already strong relationship with City Football Group by becoming the Official Recruitment Partner of double title winning side Manchester City Women’s FC. Manchester City Women is one of the UK’s leading Women’s Super League (WSL) teams and was crowned FA WSL and Continental Cup champions in 2016. The team has won more domestic trophies than any other WSL team since the League’s expansion to two leagues in 2014 and plays at the 7,000 seater stadium in the City Football Academy, where they will go head to head with Olympique Lyonnais this weekend in their first UEFA Women’s Champions League semi-final. Manchester City Women qualified for their historic semi-final place last month following a triumphant win over Danish side Fortuna Hjorring. Interest in the WSL is growing at a fast rate, Manchester City Women reported a 48% increase in WSL game attendances in 2016 and has also achieved the League’s record attendance for the last two seasons. With football now the top participation sport for women and girls in England, and the fastest-growing participation sport in the UK, attendances are expected to continue to grow over the next few years. Hays is currently the Official Recruitment Partner of Manchester City Football Club and New York City Football Club. 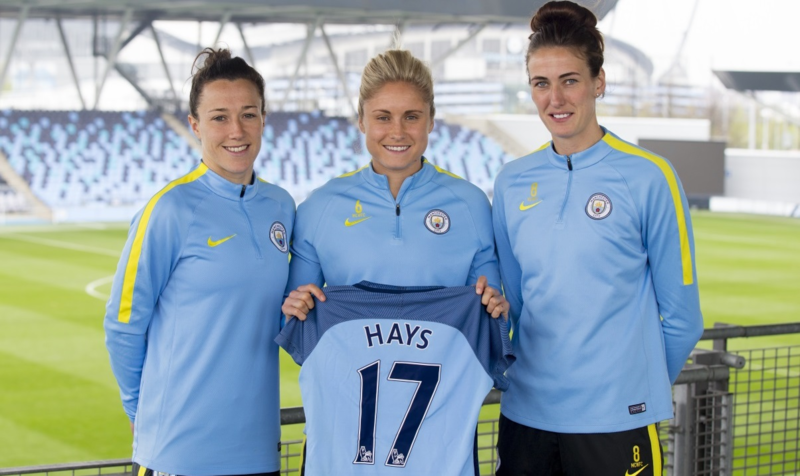 Expanding this relationship with the City Football Group to now include the Manchester City Women’s team is a first for Hays as it represents their first foray into women’s sports. Hays plans to activate its partnership with one of the UK’s most exciting women’s sports teams using the club’s crest, player imagery and powerful brand messaging with a focus on producing content for digital and social media platforms, as well as match-day LED advertising and advertising in multiple domestic programmes each season.